I'm working on a tablet based application where an agent would be going through and answering a series of yes/no questions. This is running on Windows 7 and naturally the standard windows controls aren't as touch friendly as they could be. Currently the Yes/No questions are presented as a pair of radio buttons, but we're considering making these more modern / touch friendly, and we're looking at replacing them with a windows phone style toggle button. The gotcha is that our design requirement does not permit us to have any of these yes/no answers defaulted to either option, that is the control must be in an indeterminate state on initial display (the user can't put the control in an indeterminate state themselves). So the only design I can think of would be a toggle switch where the thumb of the switch sits right in the middle, then the user goes down the form either touching the left or right side of the control, or alternatively, flicking the thumb left or right to answer the questions. Does this seem like an intuitive way to present the control? Radio buttons are actually the most accurate (requirements match standard behavior) control for this. Just make larger, custom radio buttons that are easier touch targets. Remember to allow the label to also act as a touch target for the radio button. Toggle buttons are not the right control, because the user does not have the power to use them as intended... you cannot 'toggle' back to no answer. Do not use controls, even fashionable ones, if you must alter their normal behavior to have them perform as desired. The alterations will confuse the user. Perhaps something with two controls would work? 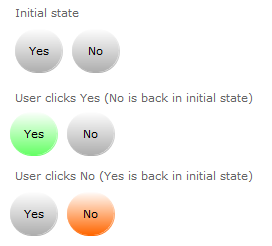 If you really want a rocker switch, then you can clarify any ambiguity of the image by using a little text flair. 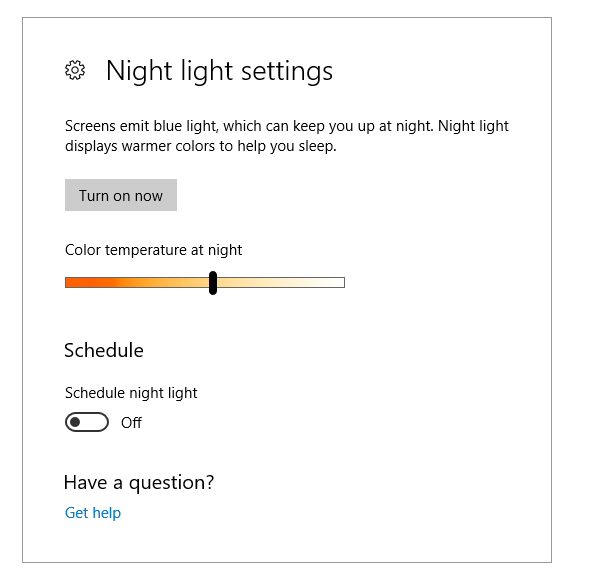 Regardless of the graphic you use in the middle, the text labels will reinforce your physical metaphor with a direct 'lit text' metaphor indicating which option is enabled. I chose red and green, but red/green colorblindness is not really an issue since the intent is more that the text is 'on' than which color it is. I personally wouldn't use a rocker switch. To much room for ambiguity. What is the middle state? I'd use an on off button and a toggle. Radio buttons for your example are the best way to go. Not the answer you're looking for? Browse other questions tagged touch-screen toggle or ask your own question.